Designed to keep the edge. By 1955, the T-54 and T-55 had been mass-produced and upgraded, but the western powers kept on innovating as well and unveiled excellent medium tanks. There was already a pressing demand to find an answer fit to western models like the M47 Patton and Centurion which frontal armor can deflect or defeat 100 mm rounds. As a result, engineers devised the 100 mm HEAT round, at first costly (and at that time the crew did not have the required training to deal with this ammo), although it had the theoretical advantage to fit into a similar (but smoothbore) barrel. No new tank model was envisioned, but this was infirmed in January 1961 when a disgruntled Iranian officer defected to USSR with his brand new M60A1. At that time engineers devised an APFSDS round which was easier to operate and could be produced in larger quantities. However, the latter was 115 mm in caliber and needed a higher muzzle velocity to be effective. Hello dear reader! This article is in need of some care and attention and may contain errors or inaccuracies. If you spot anything out of place, please let us know! Therefore new guns were tried. In 1957-58 with the D54T. Later in 1961 with the new smoothbore 115 mm (4.53 in) integrated into the T-55, but trials eventually failed. There was no way to obtain the room needed for the recoil other than dramatically increasing the turret ring. And to support the new, heavier turret, to have a lengthened chassis. This modified T-55 became the T-62, eventually, 25 pre-series were built in the summer of 1961, and by July, a full-scale production was ordered. When the production stopped in 1980 in North Korea (it stopped already in 1978 in Czechoslovakia, and 1975 in USSR) a total of 22 700 has been delivered, more than any other western model, but still far less than the combined T-54 and T-55 which were not completely replaced due to the introduction of new modern rounds compatible with the rifled gun. It found its mark on the Soviet arsenal, was used by around thirteen operators, and well-proven in combat. Its numerous limitations and issues only appeared recently and explained its replacement early on by the far better T-72. The T-62 originated in the OKB-520 design bureau of Uralvagonzavod factory (UVZ) in Nizhny Tagil, headed by a young engineer Leonid N. Kartsev. He was responsible for the modernization program of the T-54A and T-54B (Ob’yekt 137G/G2). The T-54M (Ob’yekt 139) being eventually abandoned, the team worked on the Ob’yekt 140, a 37.6 ton prototype which featured six light aluminum roadwheels, a new V-36, lowered engine, and the 100 mm D-54TS gun coupled with the new Molniya two-plane stabilization system. Trials performed in 1957 on the two Ob’yekt 140 prototypes showed a complicated maintenance and expensive parts which will make the production too costly. When in turn this project was terminated, the team worked on the (Ob’yekt 155) -The T-55- and passed onto it some of the features developed on the Ob’yekt 140, like the upper fuel tanks mounting extra ammo. At the end of 1958, Karstev began to concentrate on the Ob’yekt 140 turret. It was given a brand-new cartridge-case ejector, and the diameter was enlarged by 25 cm (2245 mm turret ring). This led to marry it on a specially-stretched T-55 chassis as all the central part of the hull had to be redesigned. Therefore the torsion beams were rearranged -although using the same roadwheels- and he poured into it mostly elements from the T-55 to ease production. Eventually three Ob’yekt 165 prototypes were built and tested in November 1958 with the 100 mm D-54TS and “Kometa” two-plane stabilizer. Two more were built for a total of 5. The T-62A (produced to 25 units only) were derived from these in January 1962. In the meantime, there were attempts to recalibrate the 100 mm D-54TS tank gun. The rifling was eliminated (producing a 115 mm caliber), then the muzzle brake, and the barrel was lengthened and fitted with a an automatic cartridge-case ejector. The bore evacuator was relocated in the middle of the gun tube rather than at the base. In effect, this experimental U-5TS “Molot” Rapira became the world first smoothbore tank gun. Fire trials were performed against the D-10TS, showing a great muzzle velocity (700 kmh), doubled range, but poorer accuracy, as expected with the loss of rifling. The final production U-5TS “Molot” (2A20) Rapira was fitted into the new Ob’yekt 140 for trials in 1958, followed by trials on the Ob’yekt 165 in 1960. Added to this were the TKN-3 commander’s day/night sight, TSh-2B-41 gunner day sight (3.5/7x magnification) and the TPN1–41–11 night sight. The commander cupola was blended in the turret casting. However the GBTU (General Armoured Directorate) expected most from senior engineer Morozov’s prototype Ob’yekt 430 in development since 1952. Morozov design bureau had the full support of General Ustinov, in charge of the production, which did not expected a radically new tank. Events changed dramatically with -according to Zaloga- the capture of a brand-new M60A1 which shows not only the brillance of the new NATO L7A1 gun, but also the armour performances of the new American MBT. 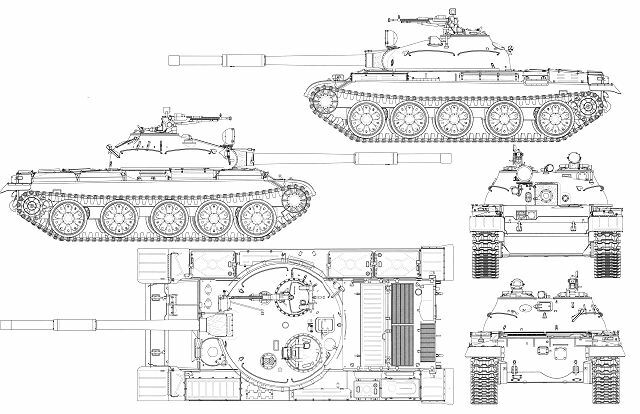 Added to this, Soviet intelligence reports claimed developmenrts and a possible production of a 120 mm gun in the west. A GBTU committed early in 1961 confronted Morozov and Kartsev projects, and since the former was only a basic upgrade of the T-55, Kartsev more promising new tank was chosen instead by General Chuikov. It was a bold move which triggered the T-62 mass-production based on the Ob’yekt 166, on July 1961. There were other projects in development like Morozov Khakiv Factory Ob’yekt 432 and Kartsev development Ob’yekt 167 equipped with the new V26 engine, but the GBTU did not wanted to wait anymore. While the chassis construction was basically the same, compartimentation and most parts identical, the suspensions still comprised five paired “starfish” model roadwheels on each side, on individual torsion bar suspensions, idlers at the front and drive sprockets at the rear. But there were differences in characteristic uneven gaps between roadwheels, with larger gaps to the two rear pairs. Also, only the first and last pairs received an hydraulic shock absorber. There were still no return rollers, and the same tracks were used. The hull armor was slighlty thinner compared to the T-55 (measurements in brackets) with 102 mm at 60° on the hull front (100 mm), 79 mm upper sides (80 mm), 15 mm lower sides (20 mm), 46 mm rear (60 mm), 20 mm bottom (20 mm), and 31 mm on the top deck (33 mm). The overall weight was nevertheless 40 t (44 short tons or 39 long tons) compared to the 36 (39 short tons) of the T-55. Protection in general was 5% better on the hull front and 15% better on the turret than the former T54/55, although to save weight other less vital parts were somewhat sacrificed. The driver was located to the left front of the vehicle and turret, and had a single piece hatch. Due to their similar engine, the T-62 could, like the T-54/55, generate a smokescreen by injecting vaporized diesel fuel into the exhaust system. There were equipped with an undutiching beam at the rear, and had a thin snorkel to ford deep rivers, usually dismounted and carried on the turret’s back. The engine was the same V-55 12-cylinder 4-stroke one-chamber, 38.88 liter water-cooled diesel which was rated for 581 hp (433 kW) at 2,000 rpm, producing a power to weight ratio of 14.5 hp/tonne (10.8 kW/tonne), also compared to the 14.6 hp/ton for the T-55. It seems having a top speed of 50 kph (on flat), compared to 48 kph on the T-55 and 40 kph cross-country (the ground clearance was 42 cm), but in reality due to the inert mass to move around, mobility and agility was somewhat reduced. It was coupled with the same mechanical synchromesh, 5 forward, 1 reverse gears transmission. Fuel capacity was 960 liters, extended to 1360 liters with two 200-liter extra fuel tanks versus 580 liters internal plus 720 liters external and jettisonable rear drums. Operation range varied from 450 km to 650 km on flat with external fuel drums to 320-450 extended cross-country. The hull could be sealed to ford rivers, but was apparently never treated NBC. Tests were also performed with the Ob’yekt 167 with a charged version of the V-26 engine, and 700 hp output. These two prototype had also a reworked suspensions and 9M14 Malyutka ATGM launchers. The 167T tried a GTD-3T gas turbine engine. It was based on the Ob’yekt 140. Although larger from 25 cm, the same hemispheric shape was kept, as the typical central spine segmentation on top, and position of the commander cupola and loader hatch on the rear left and right of the gun breechblock. The commander cupola had four periscopes with prismatic vision blocks (two front on the hatch cover, the other rear of the cupola. The loader had a single piece hatch further back to the rear, and equipped with its own periscope. Still cast, the turret internal armour thickness layout was characteristically uneven, thickest at the base and thinnest on top according to direct fire optimal angles. This thickness layout was 214 (205 on the T55 and 242 after 1972) mm at the front, 153 mm sides, 97 mm rear, and 40 mm on the turret roof. It was however slow to traverse 360° (21 sec.) with an electric system and manual backup. There was a fume extractor, as a blower was mounted in the rear of the turret, to the left of the spent cartridge ejection port. The loader manned from its position the heavy 12.7 mm DsHK M1938/46 machine-gun at the right but was exposed to enemy fire. The optical equipments were inherited from the T54/55, to the exception of the TSh-2B-41 gunner sight which has x4 or x7 magnification, coaxial with an optic rangefinder. In addition, he had two periscopes and a large main searchlight mounted coaxially on the right of the gun, plus two small searchlights, one mounted on the commander cupola. There were also two headlight, one white and one infrared. Curved hand rails on the turret sides helped the crew cimbing into it, as the infantry to hang on if needed when carried. The was also a box-shaped radiation detector/actuator. The T-62 is the world’s first tank to introduce a smoothbore gun, and to use the APFSDS ammunition successfully. It had the theoretical advantage to fire at a far greater muzzle velocity and better range, at the expense of accuracy, and to fire a large variety of modern ammunitions. The 115 mm U-5TS “Molot” (2A20) Rapira was coupled to a two-axis “Meteor” stabilizer. At its right was mounted a 7.62 mm PKT coaxial general-purpose machine gun which could fire tracers. Only four ready rounds could be stored inside the turret, while the other 36 were stored inside the front hull, next to the driver, and 2500 round for the coaxial. Provision for the optional 12.7 mm AA is unknown. The main gun could fire the BM-6 APFSDS-T, BK-4, BK-4M HEAT and OF-18 Frag-HE rounds. Elevation was limited to 16° and depression to only -4° which was customary with these soviet-design low turrets. There was no autoloader but an automatic cartridge ejector (which was innovative but had serious issues, see later) and to be reloaded the gun must be elevated or depressed to +3.5°. Normal range (extended with the “sabot” round) was 4000 m, a real improvement on the T-54/55 but only 800 m at night with a rate of fire for a trained crew of four rpm (while stationary). It was lower on the move, and accuracy was rather poor in these conditions due to the lack of efficient stabilization system or modern FCS. Both the production and numbers of users of the T-62 were quite inferior compared to the T-54/55. Well hidden during the soviet era, the design flaws which were only known facts by military experts are now public. Although largely based on the former T-54/55, and innovative with its smoothbore gun and APFSDS rounds, the T-62 cumulated issues. One was the cramped turret, barely larger than the former, but with a much bigger gun breechblock, to the point that the tank crews were chosen for their small size. By extension foreigner users had to set up the same recruitment rules to deal with it. “Comfort” standards were also poor and would have been unacceptable in western tanks. The gun autoloader automatic ejector was modified several time, and on the production model, quite energetic. In fact it was so violent and poorly aligned to the rear ejection port that spent cartridges sometimes bounced wildly inside the turret, with the risk of burns and serious injuries for the crew, accompanied with large bursts of poisonous carbon monoxide. Despite its range, the new gun was not a success mostly due to crude gun control, and firing on the move or on a moving target accuratey was tricky even at short range. Second-hit capabilities were limited. It was aggravated by a low rate of fire, very slow traverse for the turret, and limited depression/elevation (tradeoffs of the low-profile design) (a liability on a sloped terrain, as shown in numerous engagements of the cold war). This was impossible to traverse the turret while the driver’s hatch was open. In case the gunner was injured, the commander could still traverse the turret by hand, but not fire from his position not elevate/depress the gun. The T-62 was also relatively slow and could not keep pace with the numerous APCs like the BMP-1 of the red army, a problem never really solved in operations before the introduction of the completely re-engineered T-72. At the end, the T-62 was also a commercial failure. Partly due to its price: double of that of a T-55; And the fact that in 1968 an excellent 100 mm HVAPDS round was made available. It was compatible with the more accurate rifled gun of the T-54/55 and made the T-62 even less attractive for customers. Production under licence was therefore limited to Czechoslovakia and North Korea, and no Warsaw pact country adopted it. T-54/55s were kept modernized or directly replaced by the T-72 in their arsenal. Already by 1965, western tanks like the Chieftain, Leopard 1 and M60 largely rendered the T-62 obsolete. By july 1961, helped by the strong commonality with the T-55, Uralvagonzavod in Nizhny Tagil, Malyshev Factory in Kharkiv, and Ukraine and Omsk Factory No. 183 geared their production for the T-62. It was maintained until 1973 at Uralvagonzavod and shifted to the T-72, and was stopped two years later for the other plants. Waves of modernization campaigns followed. Total production was 20,000. Apparently 1500 more were built for a short period (1975-78) by Czechoslovakia and only for export. As for the T55 they enjoyed some success due to their higher quality standards. Perhaps 1200 more were built under licence by North Korea until 1982 according to the total. In 1990 a variant was designed by the North Korean Second Machine Industry Bureau, which was lighter than the original. These tanks are now first line and known as the Ch’ŏnma-ho I (Ga). The batallion commander version, based on the Ob’yekt 166K prototype. It was equipped with R-112/R-130 radio, AB-1 APU plus wire antenna base on top of the turret, and less rounds were carried to make room for these equipments. The sub-variant T-62KN received the TNA-2 navigation system and some were also equipped with the 9M14 Malyutka (AT-3 Sagger) ATGM launcher. The first (1967) had a modified engine deck, the second (1972) a modified mount for a fixed DShK 1938/46 machine gun installed on the loader’s hatch, plus new drive sprocket, RMSh tracks and an improved fording equipment. The third (1975) had a boxy KTD-1 or KTD-2 laser rangefinder installed next to the gun. Improved active protection (APS) “thursh” KAZ 1030M, BDD appliqué armour (glacis plate) and the new V-55U diesel engine. The T-62D-1 received later the new V-46–5M diesel engine. An all-out modernization campaign along the lines of the T-72. Consisted of the “Volna” fire control system, KTD-2/KTD-1 laser rangefinder, TShSM-41U gunner’s sight, new commander’s sight the “Meteor-M1” stabilizer, the BV-62 ballistic computer, and new R-173 radio. On the armament side, the turret was equipped with the 9K116-2 “Sheksna” (AT-10 Stabber) ATGM coupled with the 1K13-BOM sight. The gun itself could fire the 9M117 Bastion ATGM and received a thermal sleeve. Engineers also obtained to pack two more rounds in storage. For protection: A BDD applique armour package (two horseshoe shaped blocks), a belly anti-mine extra protection, 10 mm thick reinforced rubber side skirts and a 10 mm thick anti-neutron liner to improve the NBC protection. On the mowerplant side, a new V-55U diesel engine rated for 620 hp (462 kW) was installed. In addition, many received two clusters of four smoke grenade launchers. Sub-variants consisted of the T-62M-1 (V-46–5M diesel engine) and the “downgraded” M-1 with a revised frontal armour layout, normal night sight, no ATGM, and 1-1 and M1-2 without the belly armour or the BDD armour package. The 1-2-1 received the V-46–5M engine upgrade. -The T-62MD received the “Drozd” protection system and the MD-1 the V-46–5M diesel, while the T-62MK was the command variant of the latter. The sub-variant MK-1 received the V-46–5M diesel upgrade. -The T-62MV was the ERA version (Explosive Reactive Armor) fitted with “Kontakt-1” blocks, front, sides and turret, replacing the appliqué armor. The MV-1 received the same diesel engine upgrade while the M1V have no ATGM capability and the sub-variant M1V-1 received the diesel engine upgrade. Some T-62s were tried with AA capabilities, a rear turret box containing anti-aircraft missiles. Other experimented a new kind of protection called ZET-1 (ZET stands for Zaschtschita Ekrannaja Tankowaja) aimed at infantry carried shaped-charge weapons, taking the shape of a stretchable screen with net structure centered on the vehicle’s main armament and side flipper-type side skirts. It was seen on some T-72 in operation. The “Zhelud” autoloader was also tried. Other experiments includes the Object 167M (125 mm gun and T-72 drive-train/suspensions and engine). Two combat engineering armed variants were tried, like the T-62/122 (with a 122 mm howitzer) and the T-62/160 (160 mm mortar) and fitted with BTU. T-62 converted into a flamethrower tank, mounted co-axially to the main 115 mm gun. The Istrebitel’ Tankov-1 was developed between 1957 and 1962 by Uralvagonzavod and built by it and other to 80 units in all until 1970. These were equipped with a “flattened dome” turret containing a 2K8 ATGM launcher or later the PTUR 3M7 “Drakon” (range between 300 m and 3,300 m, 15 on board, 3 in the autoloader), assisted with the T2-PD and UPN-S day/night sights. This was the only one missile tank hunter in service in the red army, given to only two batallions, respectively based in the Belarus and Carpathian military districts. After being withrawn from active service they were converted into the IT-1T partial ARV tractors, and then into BTS-4V. For bronirovannij tyagach, srednij (“medium armoured tractor”), Similar turretless ARV conversion than the T-55, with the same equipment, stowage basket, hoist, small 3-ton cap. folding crane, winch, and snorkel. Only 35 apparently converted. The BTS-4V2 or VZ were partial reconversion of damaged and recovered vehicles. The Fire fighting vehicle conversion, with a 50-round flame-retarding projectile launcher based on the turret ring and front dozer blade. USSR at some point used massively the T-62. By 1970, it was with the T-54/55 the most common tank in the soviet arsenal, these two models counting approximately for 85% of the armoured force’s tanks. However, after 1990 (still 11 300 listed) these were gradually phased out. Most of the 1962 models which were not modernized being converted in many variants, sold abroad, or scrapped. “M” versions are kept stored now with the reserve for a secondary mobilization. Battle records includes the 1969 Sino-Soviet border conflict (one was captured by China), the war in Afghanistan from 1979 to 1988, the war in Georgia from 1988 to 1993 (South Abkhazia and Ossetia), the 1992–1997 civil war in Tajikistan, the 1994–1996 and 1999-2009 Chechen Wars, and the war in South Ossetia (2008). Outside USSR, only Bulgaria adopted this MBT en masse (250 delivered 1970-72, plus many other demobilized from the war in Afghanistan. Somewhat modernized, now deactivated or sold to Angola and Yemen). Only variants are used now like the TV-72 and TV-62M ARVs and the TP-62 fire-fighting vehicle. Austria once created a modernization package called NORICUM, centered around the British L7 105 mm ordnance gun. It was later adopted by Egypt. France, with the Giat Company also created a modernized package with the main gun replaced by the AMX-40 120 mm smoothbore and associated FCS. None was ordered. After the fall of USSR, Independent Ukraine retained a significant number (300) of T-62 in its arsenal. However by 1985, only 85 were apparently still enlisted, now all put in reserve. The T-62AG is a local upgrade package aimed at export designed by Kharkiv Morozov Machine Building Design Bureau. This version receives the 5TDF 700 hp diesel engine, 125 mm KBA-101 main gun and modernized FCS and protection. The company also offers three conversion packages variants of the T-62 or to enhance regular T-62s with the T-55AGM upgrade for the export market. Also independent, this country still counted 175 T-62s in service by 1995, all scrapped afterward. Saddam Hussein bought a considerable numbers of T-62s, starting with a batch of 100 in 1974 and 600 more in 1976, delivered until 1979. They participated in the Kurdish-Iraqi War of 1974-1991. 2150 more were ordered in 1982 and delivered until 1989. About 200 were lost during the entire Iran-Iraq war (1980-88), 50 in the sole battle of Dezful in 1981 (where they performed well against Iranian M60s and Chieftains), and 1500 of the total were still in active service in 1991 and about 1000 at the eve of the second gulf war in 2003. Kurdish PUK and KDP peshmerga forces probably used an estimated 150 captured Iraqi T-62s. 65 ex-Libyan T-62s were purchased in 1981, followed by 100 from Syria in 1982, and 150 150 Ch’ŏnma-hos in 1982. Only 50 are apparently in service today. IDF captured dozens of Syrian T-62s during the course of the 1973 Yom Kippour war. 120 in total were serviceable, known locally as the Tiran-3. A modernization took place in the 1980s, as the Tiran 5. These received the L7 105 mm rifled gun, new Israeli FCS, laser rangefinder and thermal imaging sight, and a new General Motors diesel engine. The Tiran 5s was a subvariant equipped with “Blazer” ERA protective tiles, and the turret received a rear flat plate bustle rack and two side stowage bins. The turret received also extra pintle mounts for two M1919 MG or M60s, plus the heavy M2HB replacing the Soviet “Dushka”. They are now retired and placed into reserve. Syria ordered 500 T-62 in 1973, and was delivered 200 more from Libya in 1978, and 300 more ex-Soviet in 1982. They were severely tested during the 1973 war, performing quite well in prepared positions or in night combat. By the 1990s, the were of the M and K models, and apparently a total of 1000 were enlisted. T-62 have been used recently against the Free Syrian Army, which in turn captured some. They are still in operation since the beginning of the civil war in 2011. Some were apparently used in the 1975–1991 Western Sahara War against the Polisario front. The Egyptian army ordered 750 T-62s from USSR in 1971, delivered until 1975. Too late for the Yom Kippur war, they were modernized and today, 500 are still in service while 100 are kept in storage. These modernized versions were the RO-115 Mark I (1980) with the NORICUM package, British diesel, better ammo, two-plane stabilizer, ballistic computer, laser rangefinder, BMP-3 IFV FCS, smoke dischargers and ERA. The T-62E Mark II is the phase II modernization in the mide-1990s, with a new licence-built German MTU engine (880 hp), 105 mm M68 tank gun, and Italian FCS and electronics, ATGM launchers, improved ERA and armored side skirts, plus modernized suspensions and full NBC upgrade. The phase III upgrade (2004-2008) or RO-120 Mark III is even more impressive, comprising the localy built 120 mm M-393 tank gun developed by FSUE, with increase elevation and depression (7° and +15°) upgraded MTU diesel, and improved armor for a total of 46.5 tons. 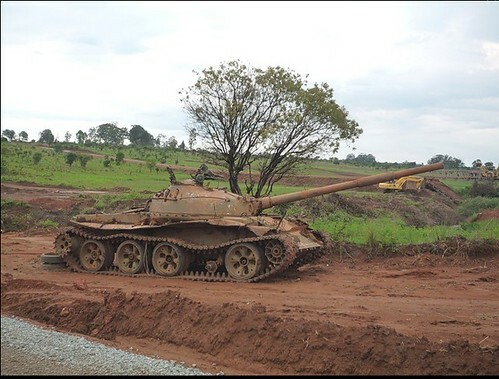 After receiving 20 T-62s from USSR in 1977 and 50 more in 1980, plus others from various sources, The Ethiopian army still fielding 100 tanks as of today. Some were passed on Eritrea. They were used against Guerillas during the Ethiopian Civil War and the Ethiopia-Eritrea Civil War of 1988. 150 of these tanks were ordered in 1973, then 400 in 1976, and 250 in 1978, and possibly more for a total of 900 (about 170 at the eve of the fall of Muhammar Ghadaffi and the civil war in 2011). They were actively used in the Libyan-Chadian War of 1982, also called the “Toyota war”, dealing with Militias armed wth modified Toyota pickup trucks with MILAN ATGMs and Recoiless guns. The remainder were used by and against the National Liberation Army and rebelling tribes in 2011. During the Yemenite wars, South Yemen received 50 from the Soviet Union in 1979, 100 more in 1981-82 and 120 more in 1989. The North yemen or Arab Republic received only 19 of these in 1979. Approximatively some were captured by the Yemeni Southern Rebels while 56 were purchased from Bulgaria in 1994. 100 were ordered for the Royal Afghan army in 1973, delivered until 1976, and 155 more in 1979 (M and M1), delivered until 1991. They were used by all sides during the war, USSR, the Northern Alliance, and later the Talibans. By the 1969 border clash with USSR, China captured a single T-62 near the Ussuri river. It was toroughly studied since the Soviets severed their technical help years ago and had some influence on local design improvements, all based on the T-54A. 280 Ex-Soviet T-62s were in service in several brigades, passed onto the Kazakh army in 1991. As of 2005, only 70 were registered. 100 T-62 were ordered and shipped until 1975, with apparently more later as still 250 are in service as of 2011. 500 in total was ordered in two batches (1970 and 1974), delivered until 1978, most probably of Czech manufacture. The Ch’ŏnma-ho was derived and then locally produced as a copy. About 1200 of these were in service in the 1980s and apparently still 1000 of the latter type and T-62s enlisted as of 2011. This country apparently had 179 T-62s and still 170 enlisted in 2005. The Tajikisjan had three in its arsenal, and Turkmenistan seven. 200 were ordered in 1978, delivered until 1979, and possibly of Czech construction. 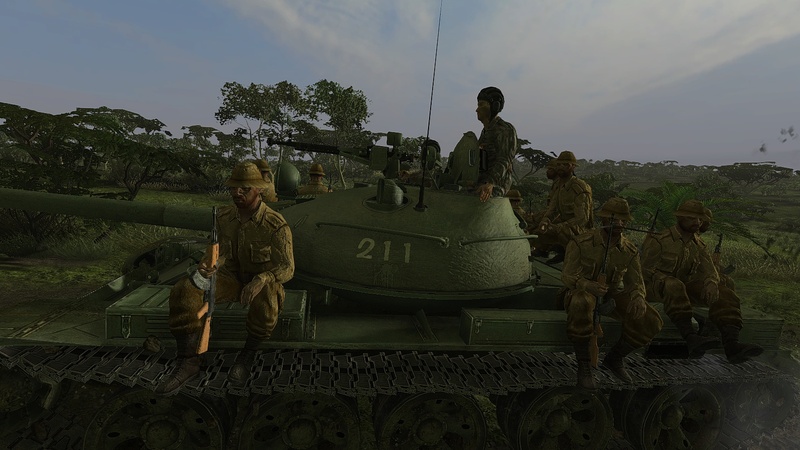 They were probably not used in combat against the Chinese in the north VN (February-March 1979 “Third Indochina War”) since all units deployed here were infantry regiments and militias, but armed with RPGs. Apparently 220 registered as of 2011. Cuba was the only known user in the area outside the USA which bought a few for evaluation and training. Cuba received two batches of 200 T-62s, in 1976 and 1983, delivered until 1988. 380 are currently in service, modernized to the T-62M standard. T-62 straight from Ultravagonzavod factory plant, 1961. T-62 early production, early 1960s. T-62 Operation Danube, Prague spring, 1968. T-62 on Moskow’s red square, 1973 military parade. T-62 of the Red Army, 1970s. Egyptian T-62, unknown unit, 1973 Yom Kippur War. Egyptian T-62 number 431 with a pale field drab blended stripes over light stone, Tank Brigade of the 3rd Army, 1973 Yom Kippur War. Syrian T-62, Yom Kippur War 1973. Libyan T-62A during the “Toyota war” against Chad militias in 1982. Iranian T-62A of the revolution guardian’s Brigade, Iran-Iraq war, early 1980s. T-62A, 81st Independant brigade of the Syrian army, Golan front 1973. T-62 from the 93th Motorized Regiment, 100th Division, Interior Ministry forces, Chechnia war, 2001. T62M of the Northern Alliance. Same, from another tank unit of the Northern Alliance. Iraqi T-62 with rubber side skirts, 1st gulf war, 1991. T-62M with BAR armor, Afghanistan 1980s. T-62M of the VDW Airborne Division in Afghanistan with BDD armor, 1980s. Soviet T-62M with Dozer blades and mine plough in Afghanistan, late 1980s. Russian T-62M ERA (Explosive Reactive Armor), 1990s. 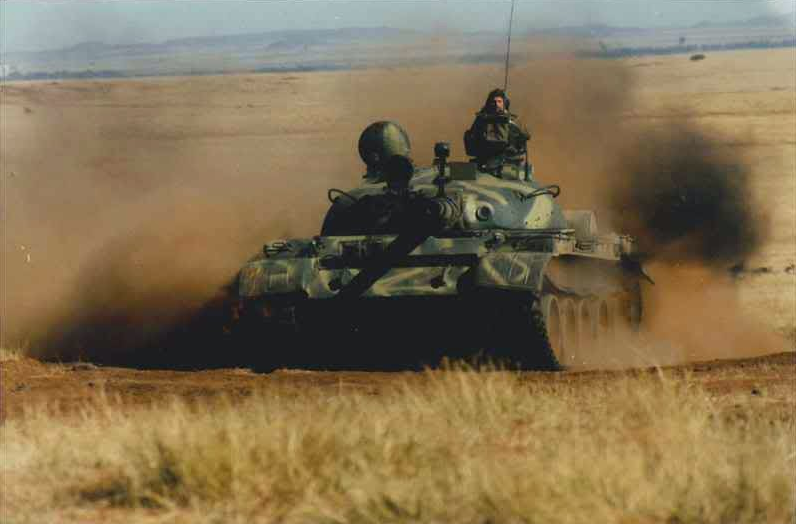 T62M in Cechnya, 2002 with BDD armor. T-62M, 160 Guards Armoured regiment of the Russian Federation, Chechnya 2001. Locally-built North Korean Ch’ŏnma-ho, derived from the T-62, 1990s. Fixed, and other mods done. no problem 🙂 (here’s a “modern” photo of it in 2014 http://f16crewchief.deviantart.com/art/T-62-477808358 ) and I must ask…have you guys thought of doing illustrations of wrecks or display pieces like the Nellis T-62 and its sagging suspension? Tanner, please check your mail, you have a message from us. Btw. T-62 was never produced in Czechoslovakia. This is just persistent myth. True. I read in Wikipedia they LOOKED at the tank, but politely declined. So did Poland. Recently captured a photo of a T-62 painted deep red with some beautiful gold pin striping artwork! Anyone know where it is or where there are more photos? La photo que vous publiez pour: intérieur de tourelle, musée de Parole Finlande est un faux grossier. Il s’agit de la photo de la mitrailleuse de caisse d’un T 54 ou d’un tout premier T 55 !!!!!!!!!! Le T 62 n’a jamais eu de mitrailleuse de caisse. A good vehicle, for its gun if nothing else. The T-62 proved to be TWICE as expensive as the T-55, hence why Czechoslovakia and Poland said ‘No thanks’ to it. That and when the T-55’s 100mm gun got HVAPDS it totally killed the whole idea behind the tank: the bigger gun. Oh well. Some countries bought it and modded it. I hope the North Korean Chonhomha (I think I just misspelled it) does better in combat than Kim Jon Un. If it doesn’t blame bad leadership. He’s a pinhead. Awesome article – thanks a million for this website. Such an excellent reference tool. Would it be possible to get a picture of the Angolan T-62 in your line-up? Thanks for trying – I also did a Google search and had no more luck than you. It seems there are no reliable photos of the Angolan vehicles on the net. The statistic for production numbers below in chart was wrong. Instead of 27,500 it should be 22,750. Hi guys, just stopped a couple of typos that need correcting. The fourth profile down should read 1968 NOT 1969 and the paragraph about Iraqi usage in the Iran-Iraq War says they performed well against Iranian Centurions – I think this should say Chieftains as Iran never operated the Centurion. One of the best tanks! Can you give me a source of the crew height restriction on the T-62? I’m currently in a discussion about the subject, and a link would be very helpful.